Leonardo Electronic Almanac is proud to announce that its exhibition The Body Is A Big Place has received the 2012 Prix Ars Electronica Honorary Mention in the Hybrid Art category. The exhibition, featuring the works by Peta Clancy and Helen Pynor was curated by Vince Dziekan (LEA Digital Media Curator). LEA Digital Media Exhibition Platform Curatoriate is composed of Lanfranco Aceti, Christiane Paul, and Vince Dziekan. Since its launch in September 2010, LEA Digital Media Exhibition Platform has held online exhibitions organized by its international curatoriate. 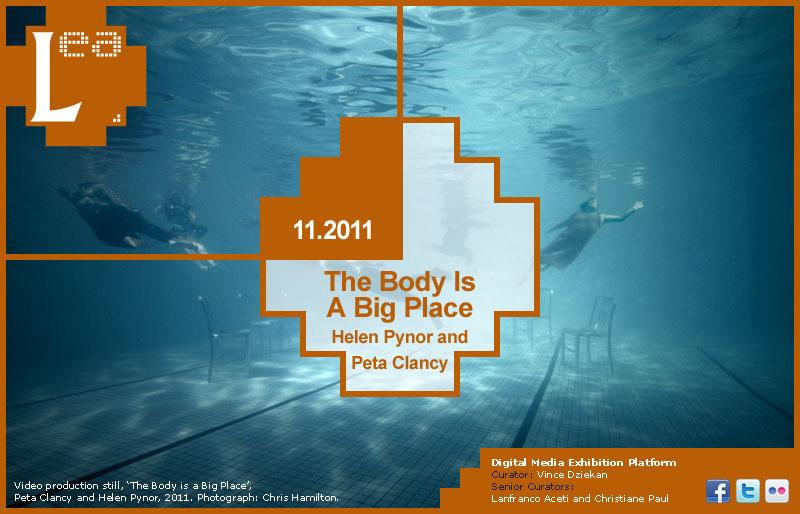 The Body Is A Big Place explores the notion of exchange in the context of organ transplantation, including the fluidity between bodily boundaries inherent to the organ transplantation process, the ambiguous boundary between life and death, and the complex and multilayered responses reported by organ transplant recipients. The work is the result of a two-year collaborative research project between artists Peta Clancy and Helen Pynor who for many years have independently explored the intersection of art and medical processes through various forms of photographic, sculptural and installation practices. Collaborators in the project include Gail Priest, Professor John Headrick and Dr Jason Peart. The art project was supported by Inter-Arts Office at the Australia Council for the Arts. Prix Ars Electronica is the most prestigious international award in the field of digital art and media. To this day, The Prix has received nearly 50,000 entries by internationally reknown artists from over 70 countries. LEA Digital Media Exhibition Platform Curatoriate: Lanfranco Aceti, Christiane Paul, and Vince Dziekan. LEA is produced in collaboration with Sabanci University, Leonardo/ISAST, The MIT Press, Goldsmiths College, Kasa Gallery, and FACT Liverpool.